Warren County is a small, rural county located in the northeast Piedmont region of North Carolina. It is majority black and also has a large Native American population. The county seat is Warrenton. While very wealthy during the antebellum era, Warren County’s fortunes declined following the Civil War. A continued reliance on agriculture drove many residents to the cities. Today, the county remains poor and largely agricultural. Warren County was the site of the Warren County PCB Landfill; the decision to place it there made many residents angry at then-Governor Jim Hunt. 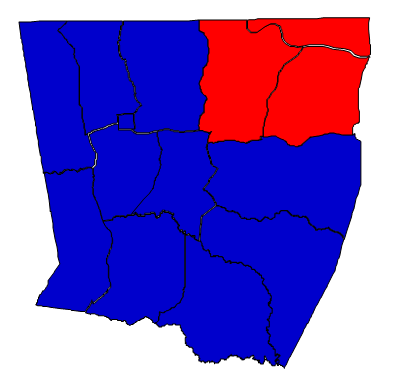 The county is solidly Democratic, owing to its majority African American population. The last time it went Republican in a presidential contest was in 1972, when it opted for Richard Nixon over George McGovern. Democrats also win consistently here in legislative and county elections. The Native American population in Warren County is the Haliwa-Saponi tribe, a triracial group. In 2008, Warren County had the highest voter turnout in the state, a result of its unusually enthusiastic and heavily organized African American population. Forecast: Warren County is solidly Democratic and it is going to be that way for a long time to come. So long as blacks comprise a majority of registered voters, a Republican victory in Warren will be pretty much impossible. Republicans also have problems because their share of the white vote here is atypically low for a Black Belt county. Only 71% of white voters here went with Mitt Romney in 2012, which is low for a rural county in this location. It is possible that those settling near the Lake Gaston area tend to be more moderate than the rural voters typically found in eastern North Carolina. Demographically, the white population is growing faster than the black population, which is barely growing. But the growth rates are not so disparate as to fundamentally alter the political dynamics of Warren County. Overall, the county grew by 5.01% during the 2000s. A decline in population is anticipated in the 2020 census. In this diverse, rural county, Democrats should continue to dominate at all levels of government. But Warren’s scanty population of little more than 20,000 renders it one of the least powerful counties in the state.